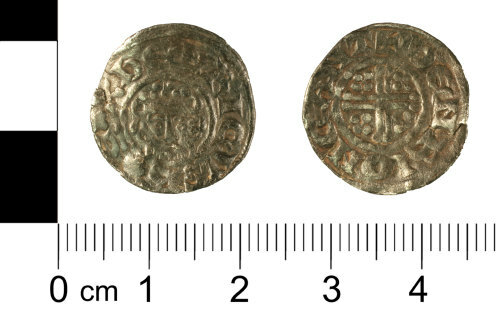 A Medieval silver coin; a short cross penny of Henry III (AD 1216 - 1272), Class 7aD dating from AD 1217 - 1222. It was struck by Henry at Canterbury. See North Volume 1 (1994), number 978 on page 222. The coin is 18.3mm diameter, 0.9mm thick and 1.25g. Obverse description: Forward facing crowned bust with sceptre, no pellets in the hair curls and no chin.